The Eastern Plains Landscape (EPL) of Mondulkiri province has the largest reproducing population of Asian elephants in Cambodia. Camera-trap photos and biodiversity surveys indicate a healthy and efficient reproduction cycle. However, given the encroachments of human settlement and agriculture into forest areas, human-elephant conflict is likely to become a significant problem in the future. For this reason, WWF Cambodia created a special team of community rangers that works specifically on elephant conservation. First training to the brand-new formulated elephant team took place in Mondulkiri province over two days on the 23rd and 24th of March. WWF Biodiversity Monitoring Technical Advisor Rachel Crouthers, who specialises in elephant conservation, along with the founder of ELIE, Jack Highwood, held lectures and practical classes for the team of community rangers, who were chosen for the government supported elephant team. Theoretical training took place in the WWF EPL office in Mondulkiri province. During the eight- hour training, Rachel Crouthers and Jack Highwood were talking about elephants’ biological features, behavior patterns and human interaction with elephants. During the lecture, community rangers were free to pose any questions and ask the trainers to explain every topic in more depth. The practical component of the training took place at the territory of Elephant Valley Project in EPL. Jack Highwood showed the enforcement team how to communicate with elephants, treat them and understand their needs. During the practice session, community rangers got a chance to put the learning into practice with two adult elephants. This provided the opportunity for the rangers to interact and effectively communicate with the elephants. After the training, the brand-new elephant team will be able to monitor elephant group presence and identify individuals to collar within the biodiversity corridor. They will also join a large-scale survey that will analyse DNA from elephant dung to arrive at a clear estimate of elephant population size in the EPL. 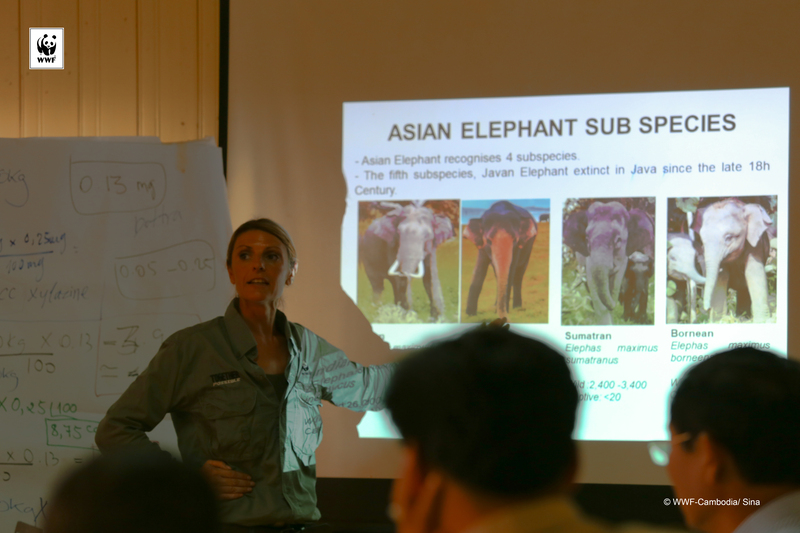 Rachel Crouthers was presenting about the types of elephants to the trainees.